I want to share this amazing object with you. It’s a skeleton key to the sky. It’s a poster. It’s a tome. Guy Ottewell’s Zodiac Wavy chart poster. This poster is HUGE. 24 inches wide x 36 inches tall. Also, it’s glossy and beautiful and full of engrossing details. You will return to this poster month after month and dwell on the intricate and scientifically-accurate renderings. 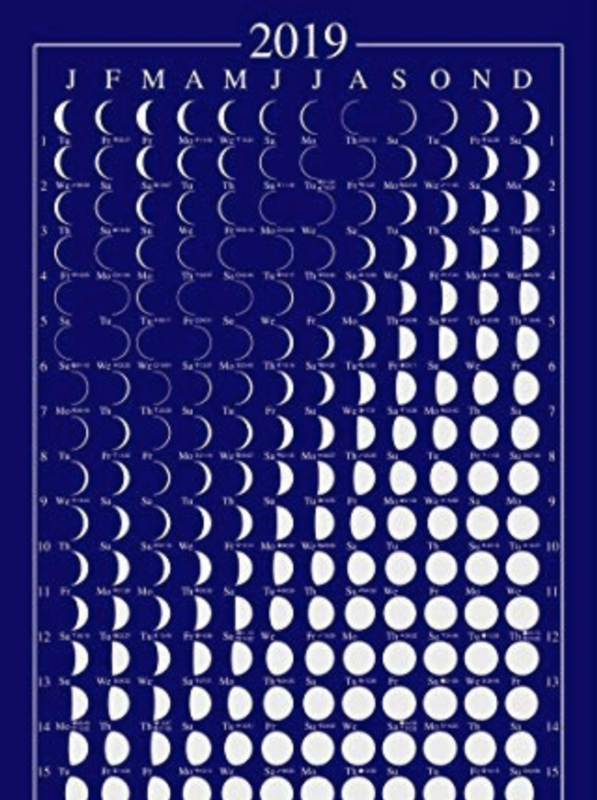 It is like a Moon Calendar but it shows the actual Moon position as well as its phase and date – plus it includes everything else in the sky. Best of all, it adds the “backdrop” of the zodiac constellations so you can see how everything moves among the stars. The Zodiac Wavy Charts poster portrays the wildness of the Moon and its dynamic motion through the sky – all in a beautiful, informative, and rewarding wall hanging. BUY the 2019 Zodiac Wavy Charts poster here – it’s on sale! Guy Ottewell’s Zodiac Wavy Charts is a snapshot of the calendar month. Every day’s events are “layered” onto a wavy band. 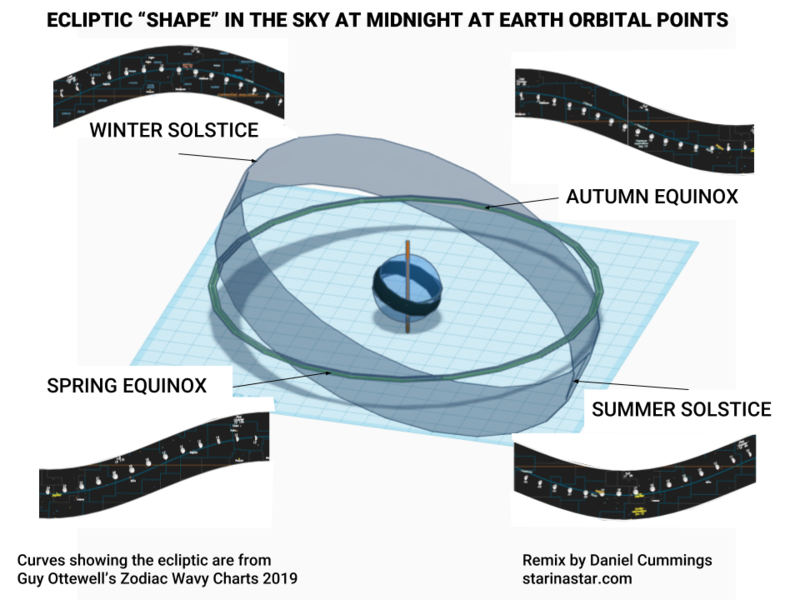 Think of those wavy charts in 3-dimensions: You can pluck one off the page, stitch it together into a ring, enlarge it, and step inside it and you’ve got a view of the most interesting and active sky chart you’ve ever seen! In a standard Moon Calendar the day squares contain the Moon phase images. The Moon images can be arranged artfully, but mostly they are placed to make the Moon conform to the month; the Moon gets “captured” into our cultural calendar. You can see the phase and the day the Moon phase will happen. This is good as far as it goes… but the Zodiac Wavy Charts poster is 100x better! Guy Ottewell’s Zodiac Wavy Charts can tell you the day the Moon phase will happen. 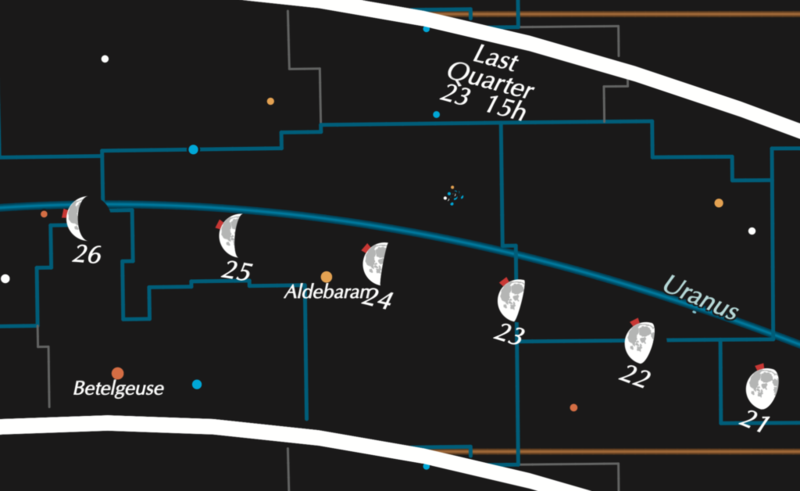 Also, it shows exactly where in the sky, and in which part of the Moon’s orbit it will happen. It tells you which part of the Moon is titled toward you, if it’s in an ascending or descending part of its orbit, and what constellation it is in. This yearly calendar packs information that will teach you how to observe and will help you make sense of the sky. It’s like having an expert astronomer on-call all year long. If you don’t have a Zodiac Wavy charts poster yet – you can order it here at Universal Workshop. 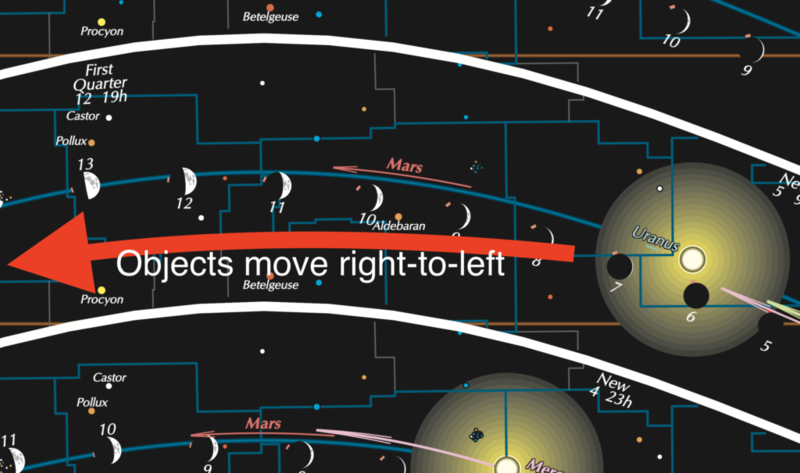 The rest of this article will help people use the deep details on the poster to understand the motions of sky objects. Note: the Zodiac Wavy charts poster shows a northern hemisphere viewpoint. All writing here assumes you are in a northern hemisphere location. Before you read this guide, please read Guy Ottewell’s text at the bottom of the poster. It explains many of the key items visible in the chart and serves as a legend. Guy’s writing provides a wonderful tour of the deep information revealed by these charts. The Sun’s movement in 1 month. Guy uses clever graphic design techniques to communicate how things move in the sky. For instance, to indicate how far the Sun moves in a month he expands the Sun with concentric rings. This clearly shows the sky location on the 1st of the month (the right edge of the outer yellow ring), the 16th of the month (the central Sun image), and the last day of the month (the left edge of the yellow ring). The Moon’s movement by day and libration. Another unique design element (a variable-size red triangle) indicates the Moon’s current libration – tilt – towards or away from the Earth. 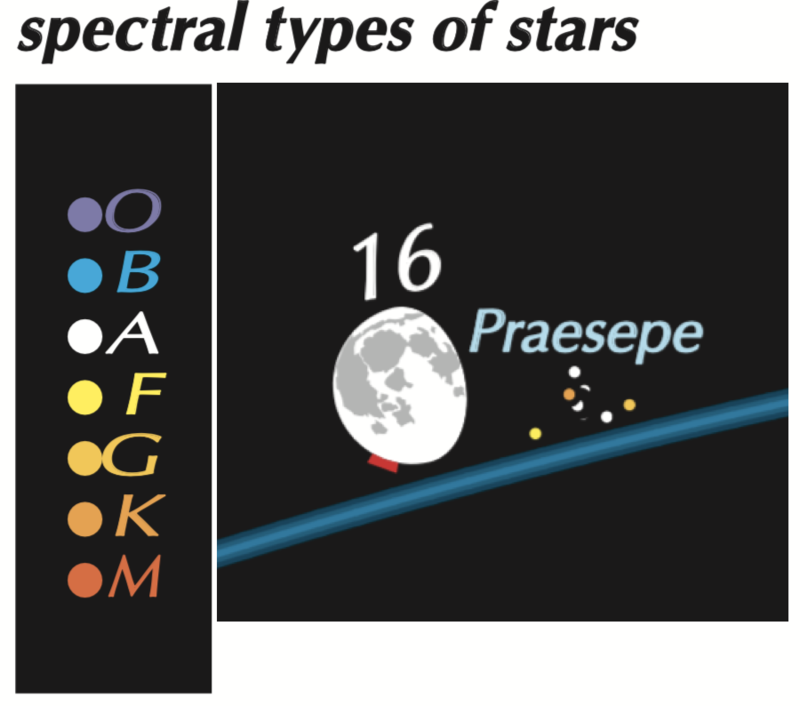 Knowledge of the Moon’s libration helps observers see hidden Moon formations. The Moon moves dynamically and this poster helps you really see that motion each day. Spectral types shown on the poster. all solar eclipses and lunar eclipses are indicated. The Astronomical Calendar Any Year has 20 pages of celestial events for 2019. Guy also has prepared a detailed list of celestial events throughout the year that you can use to pinpoint on the Zodiac Wavy Charts. The Astronomical Calendar Any Year (or ACAY for short) has a FREE listing of celestial events. You can download the year’s worth of observing data in a PDF file from Guy’s website Universal Workshop. The Zodiac Wavy Chart should be read from right-to-left. The Sun, Moon, and planets move (in general) from right to left across the sky. So too the Zodiac Wavy chart should be read from right to left. You can see the Moon phase images (and day numbers) grow from right-to-left. You can observe that the Sun moves from right-to-left over the month. Sometimes when the Moon “overlaps” itself during a calendar month, the numbering looks a little funny – this happens because the calendar month is not the same as the Moon phase month (except February) the calendar month is always longer. This article about Blue Moons shows what happens when we try to squeeze the Moon into our monthly boxes. The first and last wavy charts have lots of text indicating the constellation names, but the middle charts leave them out for clarity. If you want to find out which constellation a celestial object is “in” you can refer to the January or December charts. Use the Sun as the anchor for understanding how to read the charts. Look to the left of the Sun image in each month. The space spanning 6 constellations to the left (east) of the Sun shows you the night sky at sunset. The space spanning 6 constellations to the right of the Sun shows you the pre-sunrise sky. The midnight sky is always centered about 6 constellations to the left of the Sun. You can imagine the whole of the night sky by centering your eye on the anti-Sun which shows the location of midnight on the 16th of the month. The anti-Sun indicates the meridian (the middle of the sky) at midnight. The anti-Sun also moves from right-to-left through the sky. It could be displayed with the same-sized concentric Sun rings. It marks midnight and you can see that the Full Moon is always close by. Here’s a fun idea: turn the poster sideways and place it on an east or west wall at sunset to “see” the star band lined up with the rising “anti-sun” (east wall) or the setting “sun” (west wall). 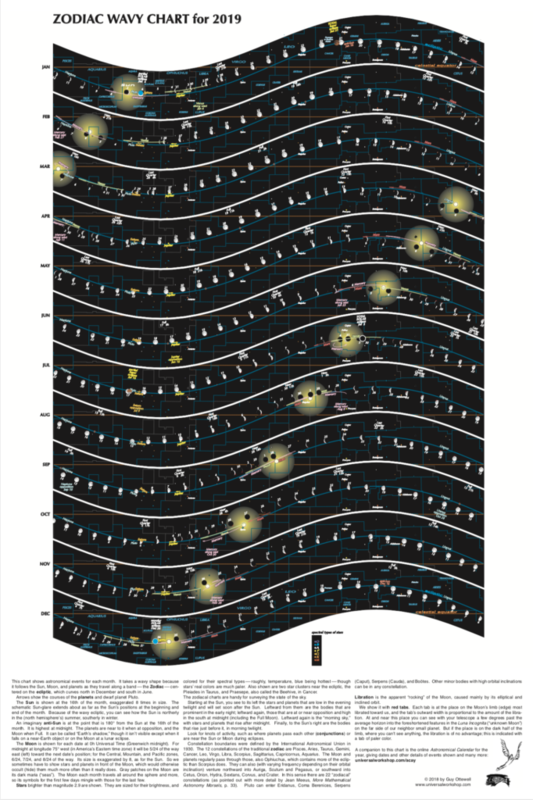 Anchoring to the Sun or the Anti-Sun may help you visualize how the Zodiac Wavy Charts poster shows you the whole sky of Zodiac constellations all at the same time. Why is the wavy chart wavy? It’s because of the way the ecliptic is tilted from the equator. The meaning of the waves. It’s easier to imagine this if you think of the Equator as the horizontal and the plane of the solar system as tilted. The location of eclipses = the location of node crossings = the location of the nodes = changes very, very slowly (18 years, 11 days, 8 hours to be exact). Look at the eclipses – there are a few of them every year and 2019 is no exception! Notice that they all occur during the New Moon or the Full Moon and that they all occur in the constellations Gemini or Sagittarius. The reason the eclipses happen while the Moon or the Sun are in Gemini or Sagittarius is because of the Moon’s orbital nodes. These nodes are “in” these two constellations this year. It’s not just the Moon that orbits the Earth, the Moon’s orbit nodes themselves actually orbit the Earth. This orbit of the nodes takes 18.6 years! The intersection with the lunar phase cycle and the orbit of the Moon’s apsides is the source of the famous Saros interval – where 2 similar eclipses occur. So, if you buy the Zodiac Wavy Chart poster for the next 18 years, you’ll see the Moon’s orbital nodes – the location of eclipses – move through each of the fixed constellations! Retrograde Motion – See it! Planet motion is cool. Planets close to the Sun never cross the anti-sun, but outer planets do. This confused our ancient ancestors who did not realize that the planets were following an orbital path around the Sun at the same time that the Earth was following its own orbital path. These two motions (the planet’s and the Earth’s) made it look like the planets sometimes moved backwards (retrograde)! You can find all of the retrograde motions easily and see exactly when and where they will happen. Degree marking – the charts lack any of the standard degree measurements (Right Ascension/Declination or Altitude/Azimuth). This type of measurement is not really necessary for general use of these charts. This is because you can find these measurements in other places. However, you may want to understand how big each section of the sky is compared to each section of the chart. You can think about it like this: there are 12 zodiac constellations (13 if you count Ophiuchus) and they span 360 degrees of the sky. We can see a bit less than 180 degrees of the sky at any one time so that’s about 6 visible constellations! Just count about 6 constellations and you’ll get about half the sky! If you divide 360 degrees by 12, you get 30 degrees. So, an average constellation covers about 30 degrees of sky. And the sky moves at a rate of about 15 degrees per hour. That means it will take about 12 hours for the sky to completely change. Want to figure out how big something is? Use your outstretched hand as a measuring tool. The distance from your thumb to your pinky (when your hand is fully-stretched out) is about 25 degrees – a little less than the average constellation width. One interesting after-effect of rendering the Sun’s position in this “wavy” way is that you can see an aspect of the analemma. The slight movement in the Sun’s position month over month traces a very slim half-analemma shape across the poster. There is a very slight speed up and slow down that you can see if you look closely. Here is an image of the poster showing the slight but noticeable curve that the Sun makes. These Zodiac Wavy Charts create a sidereal map of the sky. Sidereal refers to the fact that the background of stars remains fixed through every chart while all the other objects move through them. There are hidden treasures all through this gorgeous image. Share them with us when you find them! Why is the Zodiac Wavy Chart wavy? The charts are wavy because Guy wanted to show what was happening at the ecliptic. 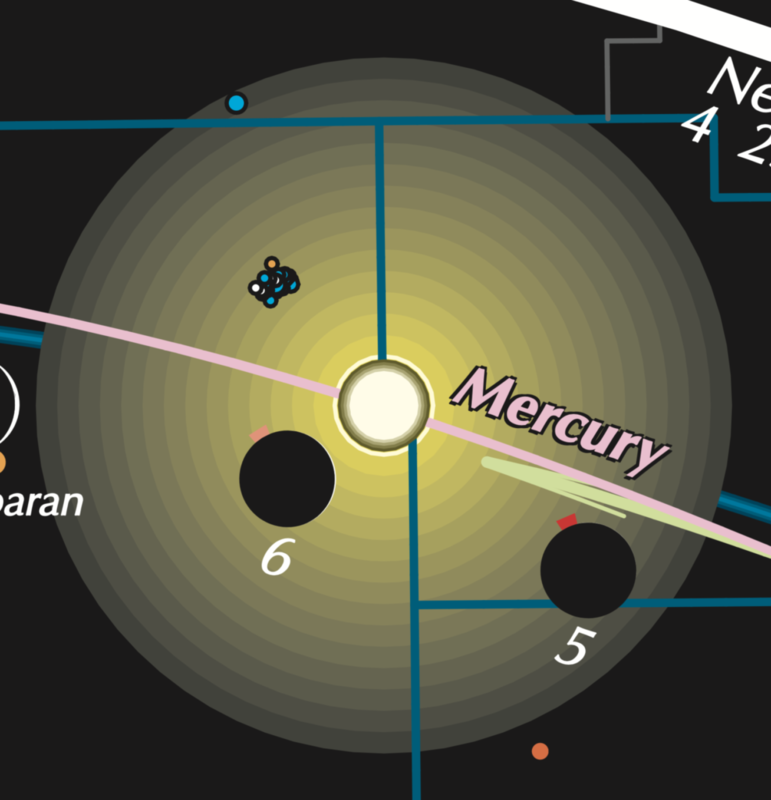 The ecliptic is tilted at 23.4˚ from Earth’s pole (90˚ from the equator). So, sometimes objects in the ecliptic are below the equator and sometimes they are above it. What is the Zodiac? The zodiac is the collection of constellations that define the ecliptic. The zodiac constellations define a band of sky where the Sun, Moon, and planets can always be found. Fun fact: Zodiac comes from the same root word that Zoo does – and it’s called that because many of the constellations are animals. Is this an astrology tool? No, this is a visual astronomy tool. Astrologers will certainly find this a useful poster to refer to, but it is designed for visual astronomy observation assistance. What can I use this for? This astronomy poster is useful for many things! Mostly, it’s a beautiful wall hanging that will draw your eye and reveal the deep celestial mechanics behind our Earth’s motion through the solar system each year. Can I order this Zodiac poster internationally? Yes – you may have to pay a little extra shipping and sometimes customs duties, but the poster can be shipped almost anywhere. Does the site accept purchase orders? No, Universal Workshop does not accept purchase orders. You can pay by credit, debit, or paypal. Can I order a 2020 poster now? Yes! Please contact Guy [at] Universal Workshop [daht] com or visit UnversalWorkshop.com and make a comment on one of the recent blog posts. Can I order in bulk? Yes! Contact Guy Ottewell for details.